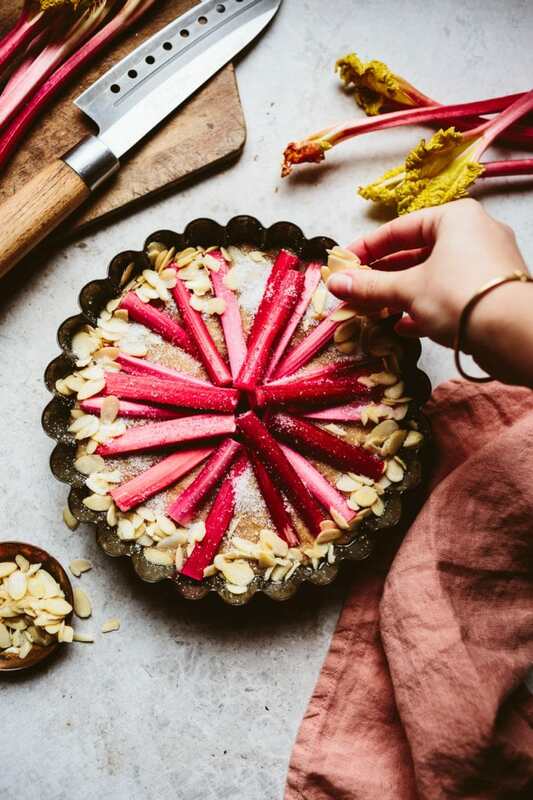 From living in Leeds for the best part of 3 years now, I’ve come to deeply appreciate the beauty that is forced rhubarb thanks to easy access to the Rhubarb Triangle. It pops up at the market, gloriously pink with those yellowy, shrunken leaves in contrast. It comes juuust in time to save me from the inevitable boredom of eating apples for the past few months. £1.50 a lb. Every time I tell my dad this he sends me a crying emoji (in London its about 5x this price). I bundle it up in my rucksack – each stalk is so long that it doesn’t *quite* fit so I carry it home with the leaves poking out the top, peeking over my shoulder. There’s so much you can do with this stuff – my favourite being to roast it with sugar & vanilla to keep in the fridge for spooning over porridge. I have a habit of buying it en masse and chopping it up to freeze for later. Here I snuggled pieces into an almond spiked cake batter and sprinkled it with glittering sugar and flaked almonds. It’s a perfect tea-time snack as is (OR microwaved with a scoop of yogurt or vanilla ice cream). Preheat the oven to 180oC (350oF). Grease a deep 8-inch (20cm) cake tin with oil or butter. In a medium pot, melt the butter over a low heat until just melted. Remove from the heat and stir in the salt, almond extract and milk. Add the egg, granulated sugar and ground almonds - stir again until well combined. Add the flour and baking powder and stir together until just combined. Pour the batter into the prepared cake tin. 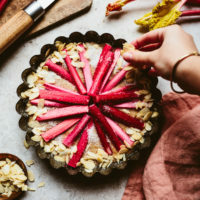 Cut the rhubarb into lengths roughly 7-10cm (3-4 inches) long . Use them to decorate the top of the cake in a radial pattern. Sprinkle the flaked almonds around the edge of the cake. Sprinkle the whole surface of the cake with 1-2 tbsp of granulated sugar. Bake for 40-50 minutes until well risen and a skewer inserted into the centre of the cake comes out clean (the surface of the centre may still look a bit gooey due to the moisture from the rhubarb but will be cooked underneath). Leave to cool in its tin on a wire rack for at least 10 minutes before slicing and serving. For a vegan adaptation use the olive oil instead of butter and non-dairy milk. Replace the egg with a flax egg (1 tbsp ground flaxseed + 3 tbsp water). I can’t wait for rhubarb to be available in Germany again! Snowdrops are up now so fingers crossed it’ll be soon. Such a beautiful cake for spring, Issy! Jeez, I missed you so much. It’s been a month or something since the last post? It’s funny, I thought Rhubarb is one of the cheapest plants in the UK, mainly because I keep seeing UK-based bloggers using it all the time in their recipes, but apparently it costs just like in Israel (here I’m buying it for 4£ for 500g and can only find it at two farmers’ markets all over the country and only during January – Feb, so when I do – I’m making your awesome grapefruit cocktail. Such a winter-y- citrus pleasure). Aw thanks, Hila! Yeah I hadn’t posted since December :O Just been bogged down with final year exams and coursework, unfortunately. Haha I think everyone here is just obsessed with it because its a) pretty and b) we can actually grow it easily in the UK (unlike many fruits) so people go crazy for it for baking! MMM yes good idea 😉 I should make myself a cocktail or two! I love how simple and beautiful this cake is!! The idea of sugared rhubarb on porridge sounds lovely. Such a beautiful cake! 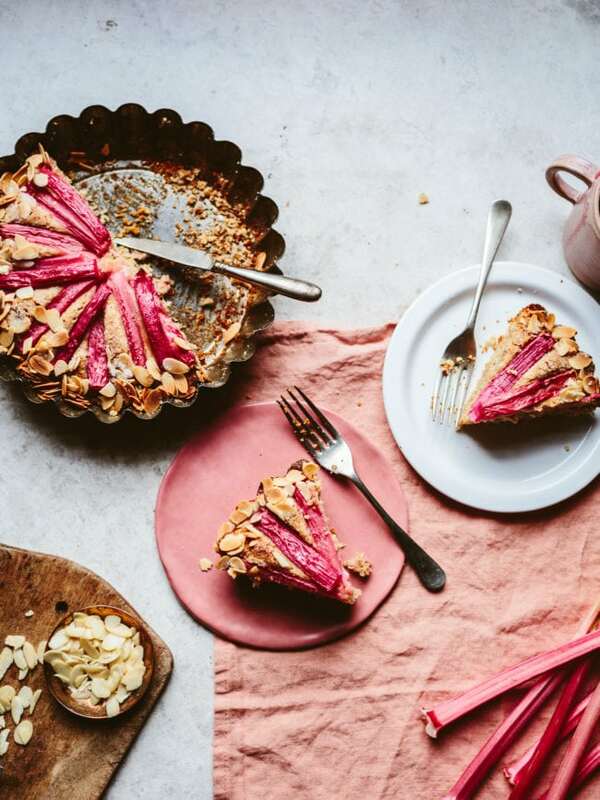 Though I’ve seen it everywhere, I have never actually tried baking or cooking with rhubarb! It seems like a really interesting ingredient, but it looks gorgeous in this recipe! I have to try it out! 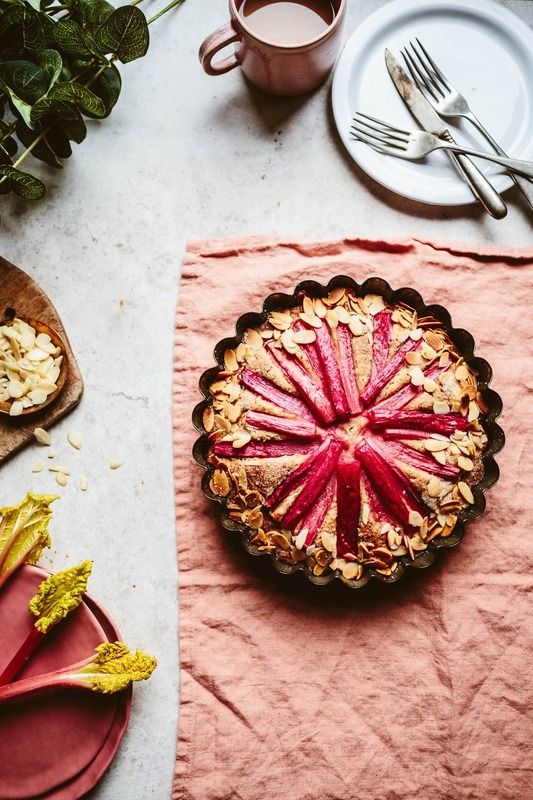 Love rhubarb so much, I made Mum plant a few when they were adding tomatoes to the garden – and it has been so worth it! So much rhubarb, all the time, even when it kinda seems out of season judging by what’s in the shops. Like you say, it’s amazing on porridge! Also crumble. Love how you made this cake in a flan tin too. 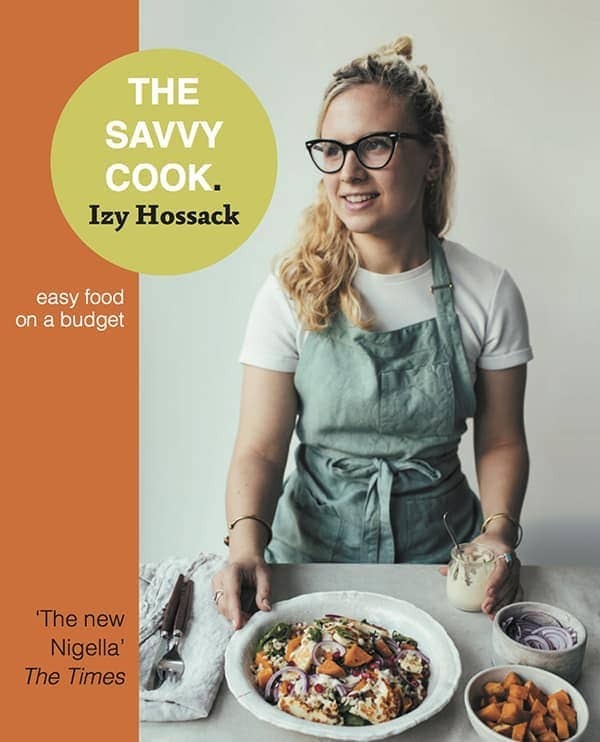 Hi Izy, do you think I would be able to sub the wholemeal pastry flour with white plain flour? Trying to use it up! What would you replace the egg with in this particular recipe to make it vegan? It looks so pretty.